← The Beneteau Oceanis 323: weekend sailboat or extended-range coastal cruiser? The Beneteau 323 is a fast, responsive and comfortable coastal cruiser. With an LOA of 32’10” (10m) and LWL of 29’2″, she has “long legs” that can take you where you want to go. She can easily be sailed single-handed. The interior is designed with space, comfort and features that you would only expect on a larger boat. 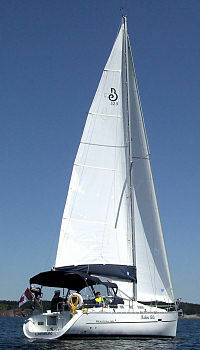 The Beneteau 323 was was named Boat of the Year at the Oslo Boat Show in 2004, shortly after it was first introduced. The design is ideal for weekend sailing in comfort, and cruises of a few weeks. 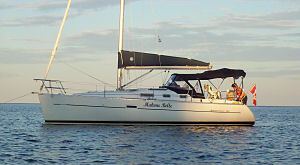 The 323 is popular with sailboat charter companies around the world. 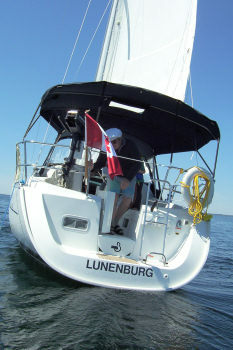 We bought our Beneteau 323 new in the spring of 2005, and sold her in 2010. 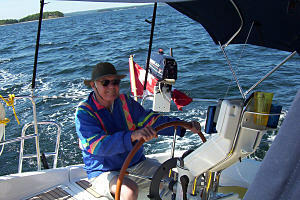 We sailed her from Mahone Bay, Nova Scotia to the Bras d’Or Lakes in Cape Breton twice, and as far as Port Mouton in the other direction, and met a wide variety of sea conditions. 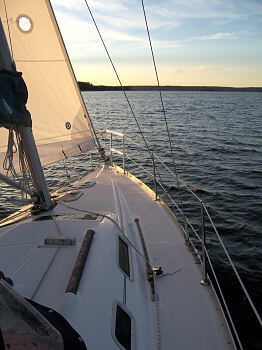 We always had confidence in the boat’s stability and ability to handle the seas we met off the shore of Nova Scotia. In another article we assess the Beneteau 323 as a coastal cruiser. Inside, she was totally dry under heavy rain or rough seas. Her bilge was dry, she still smelled new inside after 5 years, and had no diesel odor. Of course, we had taken good care of her. One thing we enjoyed about this boat, compared with older boats that we have owned, was the rigidity of the hull, making for a quieter cabin while underway (less creaking and groaning). 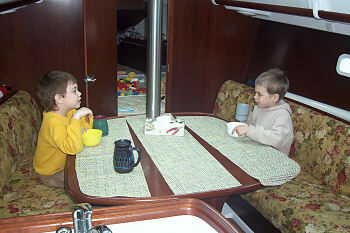 At anchor, thanks to improved sound insulation, outside noises were much reduced, including noises coming from the rigging. 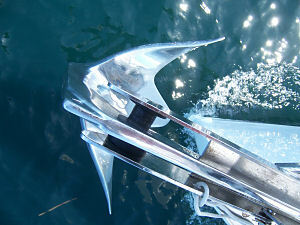 The 116% genoa is on a Harken furler. 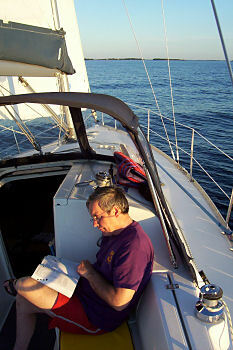 We tended to use the genoa more than the mainsail, as it was so easy to unfurl and to reef. We often flew along at over 6 knots under jib alone. The mainsail was not difficult to handle either. 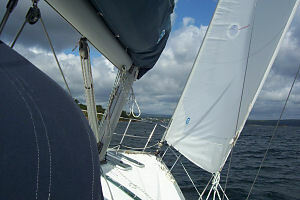 The photo on the left shows the semi-full batten mainsail. See also the lazyjacks that make lowering and stowing the mainsail in its cover quite easy – even in a breeze and on a heaving deck! 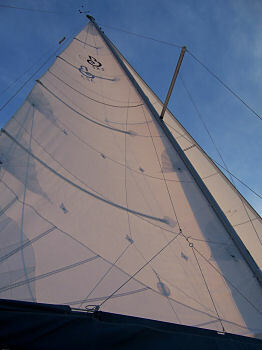 There are two reefing points in the mainsail, each with two pulleys sewn to the sail. The reefing lines lead aft, allowing you to reef the main without leaving the cockpit or getting wet. 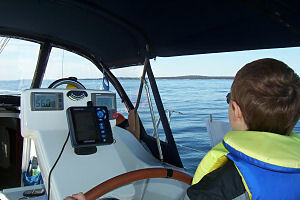 All lines lead aft to the cockpit, where self-tailing Lewmar winches make work easier. Three winches are standard, but we had an extra one installed on the starboard coachroof to handle the mainsheet. This boat can be easily sailed single-handed. The stern has a swim platform and ladder, together with a hot/cold freshwater built-in shower head. The helm seat swings out of the way for easy boarding. This is a great arrangement for older people and for kids if they must board from a dinghy. It makes sailing more accessible for less agile people. The low swim platform and ease of operation of the swim ladder are top safety features for crew-overboard situations. However, do not tow your dinghy with the painter attached to the swim ladder. It seemed such a handy place to tie the dinghy, but eventually the nuts attaching the ladder to the swim platform wiggled loose a bit. We engaged the services of a skinny teenager to crawl in from the storage locker and tighten them. After that, we always passed the painter through a fairlead on the leeside toerail and tied it to a cleat. Another lesson learned was about the stern showerhead. It did not get winterized with antifreeze like the rest of the plumbing, and as it still had water in it, it cracked. No amount of duct tape would keep it from spraying. After looking unsuccessfully for a replacement at RV stores, we had to order one from Beneteau USA, overpriced at about $30 plus shipping. Our boat had twin backstays, while most illustrations on the Beneteau site show a single backstay. The swim platform is more accessible without a backstay in the middle of it. Rigid boom vang. 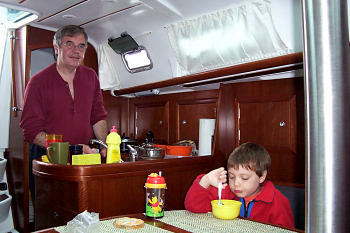 Traveller is just forward of the dodger and easily accessed from the companionway, thanks to zips in the dodger. 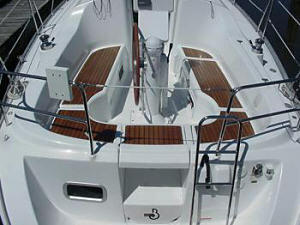 The Natty dodger, bimini and connecting piece were made by Genco Marine. A dodger is necessary for sailing in anything but the warmest of weather where we live. Connected to the bimini it makes the cockpit feel like another room. The binnacle, with the standard-issue Raytheon ST40 Bidata (left) and the autopilot control (right). In the middle is our removable GPS chartplotter, a Navman 5500, which plugs into a 12V jack on the binnacle. Ample space to walk forward, and a large, comfortable cockpit which can seat 8 people. There is a cavernous cockpit locker on the starboard side. There is an anchor roller on the bow, and a spacious anchor locker with room for installing a manual or electric winch if desired. We hauled up our 35-lb Bruce anchor by hand. Leather-covered wheel steering. Behind, the flag is flying in the breeze, and the 2hp dinghy motor is sitting on its mount on the stern rail. Note: leather-covered wheels should be removed and stored in a warm, dry place for the winter, or they may grow mildew. Lesson learned. Roomy cockpit. This picture shows the wheel turned to the side, a much vaunted feature of these Beneteaus. We did not use this feature often because it meant disconnecting the autopilot. Lesson learned: if installing an autopilot on a boat with a wheel that can pivot like this, make the connection long enough. Having only one child, we found the Beneteau 323 to be a perfect size for family cruising with the occasional guest or two. The many opening ports provide great ventilation in the cabin – a feature you will not find on many boats, even new ones. The companionway has a heavy plexiglass sliding roof panel and 2 plexiglass vertical panels, plus a hinged kickout at the bottom. The locker has a specially designed spot to stow the panels securely. The wide companionway stairs are in a well-designed 1-piece moulded unit that gives great grip at the usual angles. The Beneteau woodwork is beautiful. 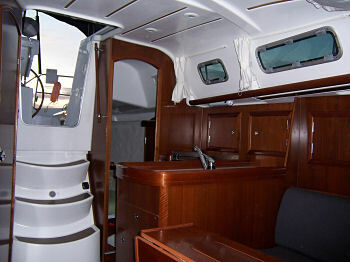 Cabin layout of Beneteau 323. Note aft cabin bedding: this is not how most couples would choose to sleep. Normally you would lie at 90 degrees to what is shown, with heads next to the hull, and feet under the cockpit. The wide companionway stairs are in a well-designed 1-piece moulded unit that gives great grip at the usual angles. Behind the galley is the door to the aft cabin. 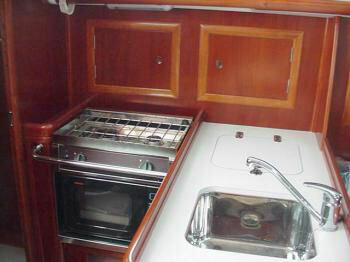 Galley with gimballed stove, fridge or icebox, and sink. The galley has a gimballed 2-burner propane stove with oven. The propane tank always lasted us all summer. There is a top-loading fridge with a drain and a pump, so you could use it as an icebox, and a stainless-steel sink. There are two cupboards behind the stove and a deep compartment to the left of the stove for bottles of condiments etc. There is 6’3″ headroom in the galley, slightly less as you go forward. Storage space would be at a premium if you lived aboard (not impossible! ), but on 2-week-long vacation cruises, we had plenty of room for the necessary supplies. Space under the floorboards is shallow, but sufficient for cans, juice bottles, etc., and there is lots of room behind and especially under the settees. 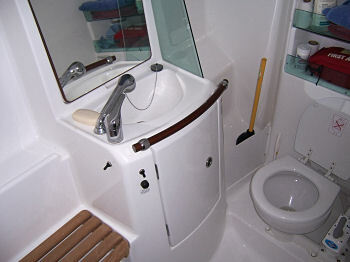 The luxurious and spacious (for a boat) head has a standard marine toilet, sink, shelves, a medicine cabinet over the sink, a separate seat to sit on while taking a shower, and even a wet locker for dripping foulies. Even a large person can shower here. The entire bathroom enclosure is a fibreglass unit, so there’s no worry about getting water where it shouldn’t go, and it has a powered shower drain. It is easy to clean. Hot and cold running water supply both head and galley sinks and the cockpit shower. There are two opening ports with mosquito screens in the head. There is a holding tank with Y-valve and macerator. Hot water is heated by the engine when it is running. We found that if the water was hot when we stopped for the night, it would still be warm in the morning – nice! Of course, when you have access to shore power, you can heat water. A proper marine power cord and adapter is included. 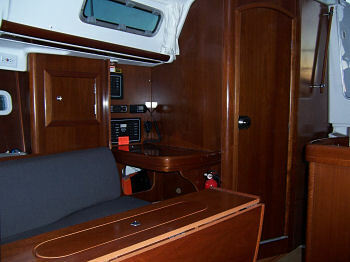 The port-side aft cabin has a door for privacy, a hanging locker, and three opening ports for great cross-breezes. The berth is king-sized in width. It is unusually large for a boat this size. It has well-placed reading lights. The double vee-berth has a door for privacy, a hanging locker, shelves along the side, overhead and reading lights, and a locking hatch with integrated blind and mosquito screen. The vee-berth is completely separated from the self-draining anchor locker forward of it by a bulkhead. Two people can sleep here if one is short or if they’re cozy with each other, because the hanging locker limits the length on the port side. It made a great private space for a kid. 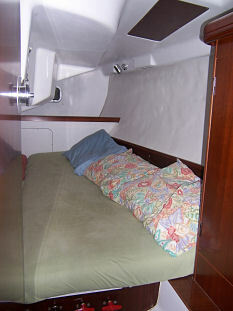 The two settees in the main cabin also make comfortable 6’+ long berths. The double folding table seats 6 comfortably and has a compartment in the middle, designed for storing bottles. The mast is stepped on a post that runs down to the keel through the salon table. We made table runners of plastic shelving material to protect the woodwork and keep dishes from slipping on the smooth surface. You can see the plastic runners in the photo of the two kids. The main cabin has a locking roof hatch with integrated shade and mosquito screen, like the one in the vee-berth, and 3 opening Lewmar ports with mosquito screens. This gives great ventilation down below. The opening ports are a feature that distinguishes the Beneteau from similar models by other builders. Large Plexiglas portlights in the cabin roof provide plenty of light. There are white curtains and plastic mosquito screens were provided for all ports. After five years of sun exposure, some of the elastic was getting loose, but it could easily be replaced. There are storage cabinets on both sides of the salon, and halogen and fluorescent lights in various locations. There is good storage under the settees and a narrow space behind the settee backs, where we stored books, magazines and board games. We added floral settee cushion covers that gave the cabin a distinctive, cozy, homey feeling. The cushions are molded foam, and very comfortable to sit on – though quite challenging to sew covers for! There are a chart table and an instrument panel on the starboard side, with storage under the table surface adequate for charts folded in 8ths. 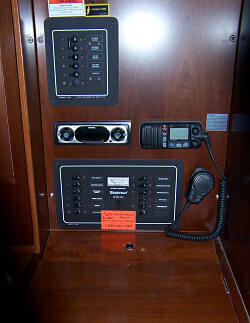 On the instrument panel, top to bottom: shore power panel, receiver/CD player, ICOM VHS with DSC, 12V panel. The receiver/CD player has speakers in the salon and in the cockpit, and has a remote control. You can fade the speakers so that they play only in the cockpit or only in the salon. Our boat came with a Yanmar 3YM20 3-cyl. 20 hp diesel engine. Specs on engines differed over the life of the model, so another 323 you look at may have a different engine. 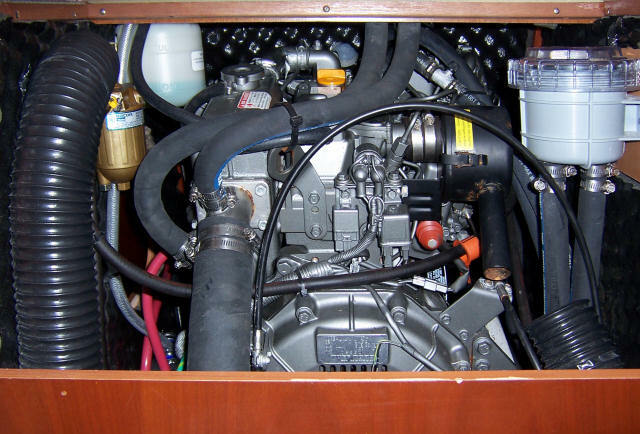 The engine is easily accessible for servicing from three sides: front, back (through the aft cabin) and side. All components are within reach. We had a 3-bladed folding brass Flex-O-Fold propeller factory installed. This proved to be an excellent choice. 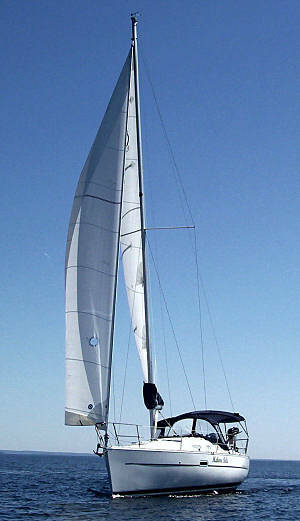 Three blades provide extra torque when you need it, and the folding function reduces noise and drag while under sail. 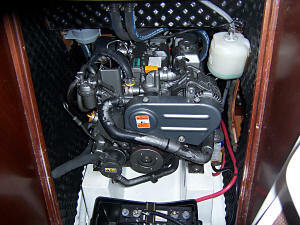 The 20 hp Yanmar engine, viewed from the companionway. Ballast (standard) : 2,414 lbs. Fuel Capacity : 17 gal. Water Capacity : 42 gal. Sail Area : 542 sq. ft.
See the Beneteau spec sheet here. We had flood lighting for the deck installed by the dealer, who also installed the autopilot and a 12V jack in the binnacle, which we used for our GPS chartplotter and, with an inverter, for recharging cellphones and batteries. Standard equipment includes ICOM VHF with DSC, Raytheon bidata with depth, speed and water temperature, shore power panel with polarity reverser and marine power cord. The Beneteau Oceanis 323: weekend sailboat or extended-range coastal cruiser? – on this site. An excellent review of the Beneteau 323 by Practical Sailor. Pingback: Sailboat Charter – Yahoo! Canada Answers – What type of sailboat is the safest?